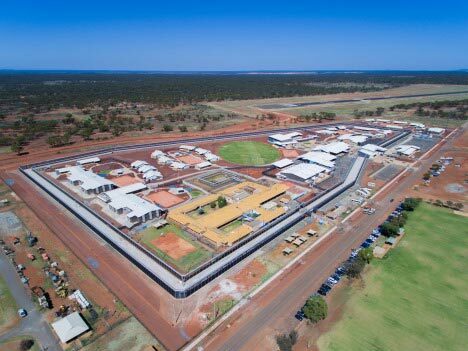 Palisade and Maxiguard® are strong, robust, steel pale, post and rail fence systems which rake to sloping ground. 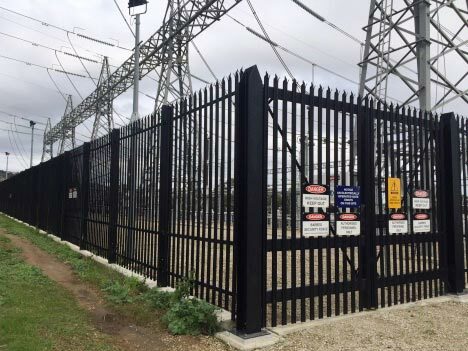 They are a rigid bolted fence system with anti-tamper shear nuts. 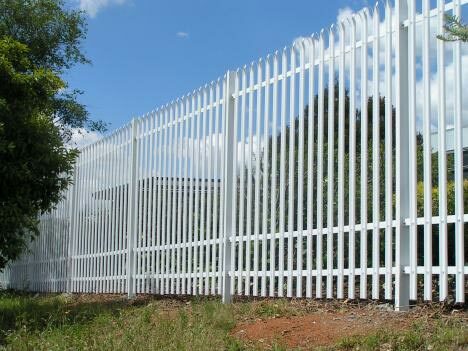 Palisade is a straight pale design, and Maxiguard® provides increased scaling difficulty with an attack side outwardly curved pale top. We have our own in-house pale rolling beds which can produce around 800 pales per day, so supply is very quick. 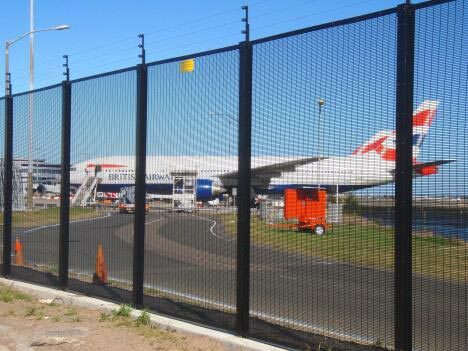 Our designs are based on British Standard BS1722-12:2006 Specification for Steel Palisade Fences, with numerous design options available. We make British Standard Security Purpose (SP), General Purpose (GP) and our own Commercial Grade (CG). Please contact us so we can help you with which best fits your need and budget. Pales are in a ‘W’ profile which provide great strength. You have the choice of 3mm, 2.5mm and 2mm pale thickness, and triple point, single point or flat pale tops. 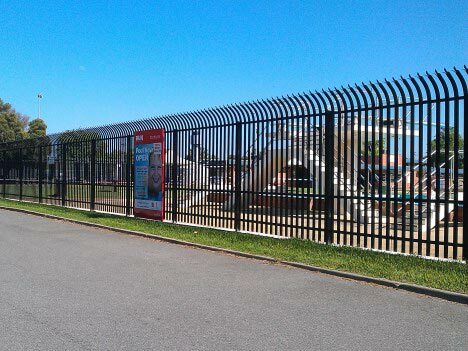 Extra fence hardening and strengthening can be added with Gryffin’s Enclosure® system or cable ram-resistant system. 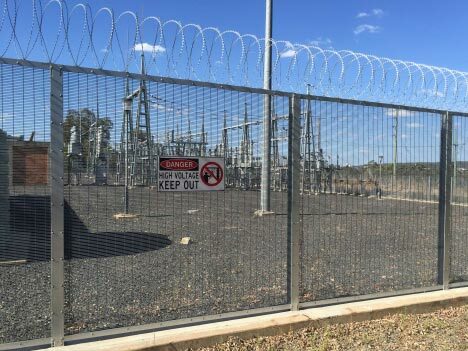 Palisade is an all-steel modular straight pale fencing system, specifically designed for installations where a high level of security is required. Maxiguard® has an attack side outwardly curved pale top for installations where an even higher level of security is required. Palisade and Maxiguard® are based on BS1722-12:2006 and available in various grades, and galvanized or powder coat finishes. Cold roll formed to “W” section design. Finished width 71mm. W-Pale heads are press formed and splayed to a “triple point”. A finished pale is straight with no visible twist or warp. Pales are generally fence height less 50mm for ground clearance. Cut to length to allow appropriate footing depth. Top of post cropped and beveled to form point. Web slotted with 42 x 9 mm slots to receive rail joining fish plates. Optimum post spacing is 2750 mm or less. Hot dip galvanized after fabrication to AS 4680 – 2006. Manufactured to British Standard BS1722-12:2006. Tapered Flange Beam (TFB) 100 x 45 mm x 7.20 kg/m up to 2.4 m in height Grade 300 plus; I: Moment of inertia Y Axis (90 deg to fence line) – 0.0795×106 mm4, X Axis (along the fence line) – 1.46×106 mm4. Minimum tensile strength 440 MPa. Material to Australian Standard AS 3679.1-300. 152.56 mm center to center (general). Fence can be made to any height upon request. Post lengths can be varied to suit site conditions or structural engineers requirements. Equal Angle 50 x 50 x 6 mm x 4.46 kg/m. 14mm square hole at 28 mm centers from each end. 17 off 11 mm ø holes punched at 152.56 mm centers along the length. Hot dip galvanized after fabrication to AS 4680 – 2006. Manufactured to British Standard BS1722-12:2006. Material to Australian Standard AS 3679.1-300. Square edge flat bar 40 x 8 mm x 2.58 kg/m. 140/110 mm long with 2 off 25 x 14mm slots at 28 mm centers from each end. Hot dip galvanized after fabrication to AS 4680 – 2006. Manufactured to British Standard BS1722-12:2006. Material to Australian Standard AS 3679.1-300. 500mm x M12 Galvanized Threaded Rod for vertical rail alignment. Rail to fish plate: M12 4.6 grade galvanized bolt, and tamper proof 4.6 grade shear nut. Pale to rail: M8 8.8 grade galvanized T-bolt, and tamper proof M8 4.6 grade shear nut, or at additional cost 6mm Pin and Collar rivet (Huck, Avdel etc). Gryffin’s standard process is to powder coat over a galvanized finish, to provide a duplex system, where the galvanization provides corrosion protection should the powder coat surface be penetrated and the powder coat top coat provides aesthetic appeal and or additional weathering protection. Gryffin follows third party supplier galvanization and powder coating standards, and only uses Certified Powder Coat Applicators. Standard powder coating is suitable for general non-corrosive environments, and greater than 1 km from the sea. No Warranty provided. Harsh environment powder coat options with Warranty available on request. Conditions apply. Galvanized finish: Following installation of all fasteners, break off points should be treated with a generous coating of zinc rich cold galvanizing paint. Powder coat finish: As above with the addition of a matching colour touch up paint. Gryffin designs, engineers and manufactures to any requirement and specification required.